It gives me great pleasure to welcome Your Highness SheikhTamim bin Hamad Al-Thani and the distinguished members of your delegation to India on your first State visit. We have fond memories and vivid recollections of the memorable visits of your respected father, His Highness Sheikh Hamad bin Khalifa Al-Thani to India in 1999, 2005 and 2012. We also remember the visit of Her Highness Sheikha Mozah to India in 2006. These are important milestones in our relations. The visit of the then Prime Minister, Dr. Manmohan Singh, to your country in November 2008 marked a significant step forward in further strengthening our bilateral ties. Your Highness, our two countries have deep and rich historical connections based on geographic proximity and cultural commonalities. Qatar is a part of our extended neighbourhood. Our civilizational links find expression in our mutually beneficial, growing economic and commercial exchanges and close people-to-people contacts. There is a lot that we can do together to realize the existing potential in our trade and investment ties. The rich experience of our globally reputed companies in executing infrastructure projects of the highest standards is at the disposal of our Qatari friends. We are confident that they would be worthy partners in Qatar's economic progress and would contribute meaningfully towards your country's preparations for the 2022 FIFA World Cup. 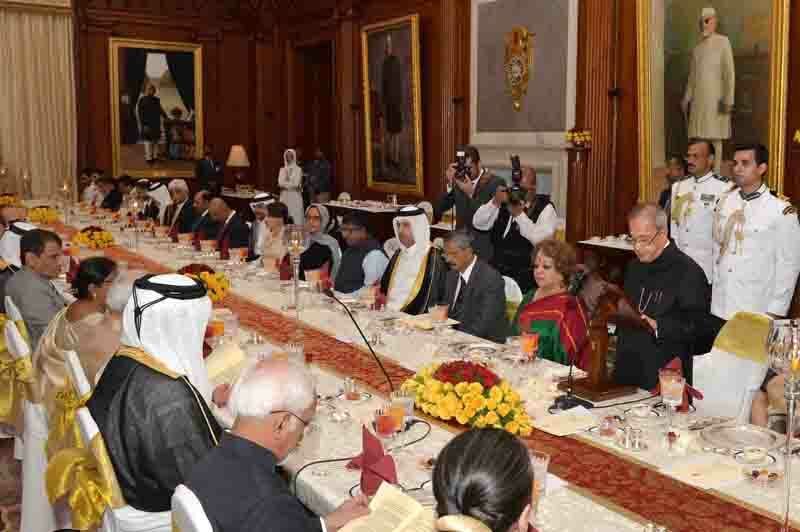 India deeply values Qatar as a reliable source of energy. It is time that we convert our commercial synergies into a deeper energy partnership through India-Qatar joint ventures in refineries and petrochemicals projects in India, as also through joint exploration in third countries. Your Highness, India is currently among the fastest growing economies in the world. To meet the legitimate aspirations of our people, we need to continue on an inclusive and high-growth trajectory. This requires a capital injection of over US $ one trillion in the years to come in our infrastructure sector, including power, ports, highways, supply chains and warehousing, to name a few. India invites investors and entrepreneurs from Qatar to look at India’s infrastructure sector and to join in the "Make in India” and "Digital India” initiatives of our Government. Our 100 Smart Cities project is open for foreign participation. Foreign investment caps have been eased in construction, railways and defence sectors. We look forward to new partnerships and collaborations in areas of common interest. Your Highness, Qatar has generously embraced a large number of Indian expatriates and has encouraged them to flourish and prosper, for which we sincerely thank you. The positive contribution that the Indian community in Qatar has made towards the development and progress of their host country has been well acknowledged and appreciated. We are confident of the continued support of Your Highness in ensuring their safety and well-being. Your Highness, you come from a region which is of vital importance to us. Peace and stability in West Asia is in our common interest. Our cooperation is necessary for countering terrorism and maritime piracy that affect both of us. We deeply value your sincere affection for India and our people as also the personal commitment and contribution of His Highness Father Emir in strengthening our close relations. I am confident your visit will write a glorious chapter in our excellent bilateral ties. - to the continuing friendship between our peoples.